Allows for longer lasting and proper equipment functionality. The built-in AC Noise Filters gets rid of unwanted radio frequency (RFI) and electromagnetic interference (EMI). The 9 front panel power switches are the perfect solution for controlling the power flow to any of your equipment and devices. The Spike and surge protection ensures equipment stays safe and your power stays clean. 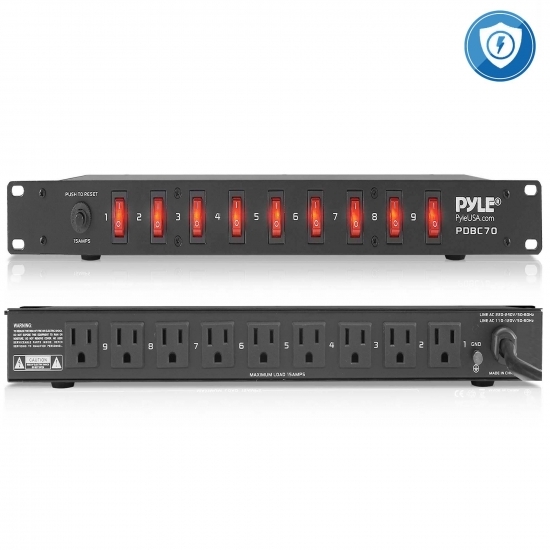 System includes as total of 9 power supply outlets. 15 amp rating with circuit breaker and push to reset function with current protection. Operating Voltage: 115 – 230V/50 – 60Hz. WHAT DO YOU GROUND THIS UNIT TO. The unit has a three prong ground on the electric cord that grounds the entire unit. Your website lists the depth as 3.9 inches, but your manual lists the depth as 170mm, which is about 6 3/4 inches. Which is it?